A sea salvage operation disturbs a species of underwater creatures known as sea vampires, who attack in the dark while draining their victims of blood. Owen Powers joins the sea salvage barge The Black Drum, which is run by Glen Hunter with his son Joe and his daughter Donna. While on a dive, deckhand Jonas is killed by a sea creature presumed to be a shark. Jonas’ body is later found by Megan Arthur, a professor of marine biology at the University of Alaska, who believes that Jonas was actually killed by an undocumented underwater species that exsanguinates its victims. Rival dredge operator Travis Thorne outbids Glen on a salvage lot in his ongoing effort to put the Hunters out of business. Megan meets the Hunters to report on Jonas’ dead body and Joe tells her the local legend of underwater sea vampires. When he and a friend are attacked by one of the creatures while fishing, Glen sends a distress call to his children. Joe, Donna, and Owen rescue Glen from the water, but a baby creature bursts from Glen’s torso en route to the hospital. Owen calls Megan and they capture the creature for research. As the sea vampires continue to attack boaters and fishermen, Joe reluctantly makes a deal for assistance from Thorne, to whom Joe secretly owes a considerable gambling debt. Meanwhile, Owen and Megan discover that the sea creature can be stunned as well as exterminated by powerful light sources. Donna eventually learns of her brother’s involvement with Thorne, although Thorne and his men are killed in a showdown with the monsters. Megan is also killed, but Owen, Joe, and Donna are able to eliminate the rest of the creatures and save themselves with a coordinated light attack. There are any number of reasons why a self-imposed moratorium on watching SyFy channel creature features might be a smart idea. The most obvious one of course is that the majority of them are not terribly enjoyable. But the more I watch these formulaic monster movies, the more I wonder if I’m losing my perspective on how to evaluate such made-for-cable messes objectively. Are these movies all supposed to be middling efforts with cheesy effects and mediocre acting? What is the line separating a “who cares?” filmmaking attitude from intentional “so bad, it’s good” entertainment? 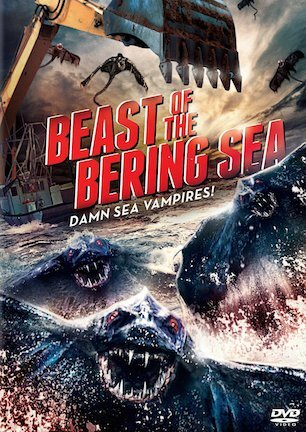 I’m no longer certain if the bell curve for rating something like “Beast of the Bering Sea” should be aligned with “Godzilla,” “Sharknado,” or “Plan 9 from Outer Space.” What is it that an audience even wants/expects from SyFy monster movies nowadays anyhow? Perhaps the best way to be impartial is to step back from too much personal opinion and simply break down the film in a matter of fact manner. That should make it easy enough for the reader to infer his/her own conclusion about the quality of the film. Cast – The top billed stars are Cassie Scerbo, who by all accounts is best known for her role as Nova in “Sharknado,” and Jonathan Lipnicki of “the human head weighs eight pounds” fame. Others can conclude what they wish about the depth of that roster, but let’s just say that at least for the latter, this is a step backward from a Cameron Crowe-directed blockbuster starring Tom Cruise and leave it at that. Effects – The “beast” in “Beast of the Bering Sea” resembles a stingray with the head of a Gorn from “Star Trek” covered in a black plastic garbage bag and then rendered with outdated CGI. That might not sound like an objective description, but it is. Story – Here is a synopsis of “Poseidon Rex” (review here), another sea beast flick that previously aired on SyFy: While digging for gold underwater, a dive team inadvertently unleashes an undocumented species of sea creature. After the creature kills a rival crew of villainous gangsters, the heroes team with a female scientist to take down their amphibious enemy once and for all. Now here is a “Beast of the Bering Sea” synopsis: While digging for gold underwater, a dive team inadvertently unleashes an undocumented species of sea creature. After the creature kills a rival crew of villainous gangsters, the heroes team with a female scientist to take down their amphibious enemy once and for all. Yes, I did cut and paste that summary. No, it was not in error. At this point I could go into the weird musical score, which at times has an 8-bit chiptunes echo resembling a song from a 1980’s Nintendo game. Or I could also mention the uneven directing that allows Lipnicki and Scerbo to overact while other performances bang into the opposite end of the spectrum. But then I’m right back to my initial dilemma of questioning if this is the movie hitting the low bar it aimed for, or if the filmmakers really did not know any better. Depending on what its unstated intention might have been, (being either a throwaway time killer no more underwhelming than any similar film, or something with the loftier ambitions of a memorable movie,) “Beast of the Bering Sea” is either a home run dinger in a Little League ballpark, or a big time strikeout in a Major League stadium. Given that conflicting assessment, the only fair way to score the movie is to split it right down the middle at 50 out of 100 and call it a day. Besides, by this point you either know what you are in for with a SyFy Original produced by The Asylum, or you are doomed to be burned once for being the one who did not know any better. April 13, 2014 by Ian Sedensky.